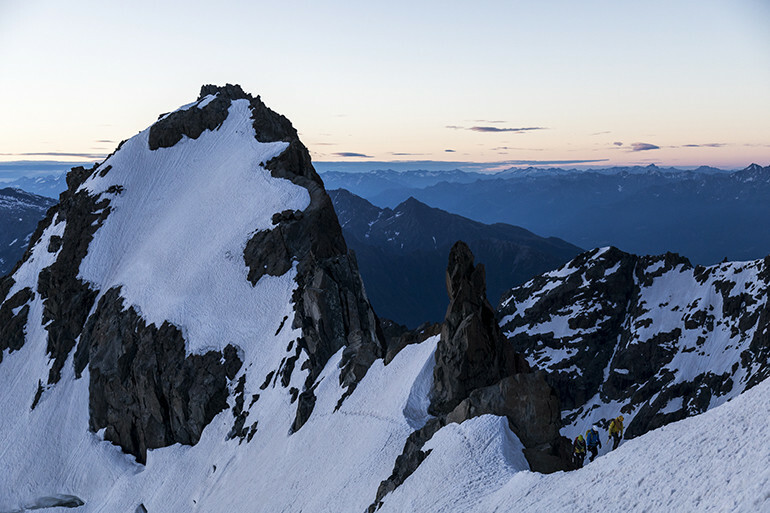 It’s the beginning of summer, and at 3:45 am four mountaineers come out of the Oggioni Bivouac, a red box set on the side of Monte Disgrazia – Mount Disgrace. 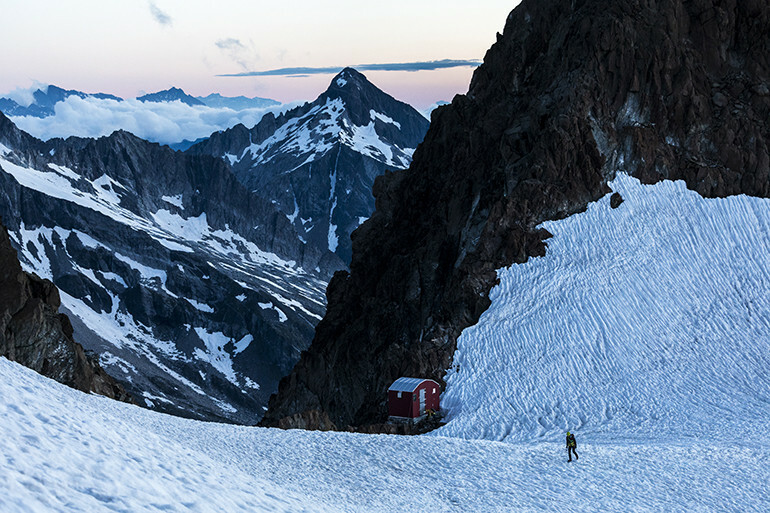 In their eyes, you could see all the expectation for a day that promises to be meteorologically perfect and without any anxiety for the discouraging name of the mountain. In fact, there is no mountaineering disgrace that falls on this peak. Only a bad translation from the local dialect, disglacia, meaning ‘melts’, referring to the glaciers and the many streams that come from there. Maybe that's okay, as it adds something epic to one of the peaks symbolising Valtellina, the divide between Valmalenco and Val Masino. But there is also a good children’s story about a certain Pizzo Bello – Beautiful Peak. So beautiful that the shepherds upon admiring it were so enchanted they ignored the requests for help from a beggar, who got his revenge by cursing the mountain and making it barren and dry. From this fairy tale, at least the part concerning the beauty of Mount Disgrazia is certainly true. 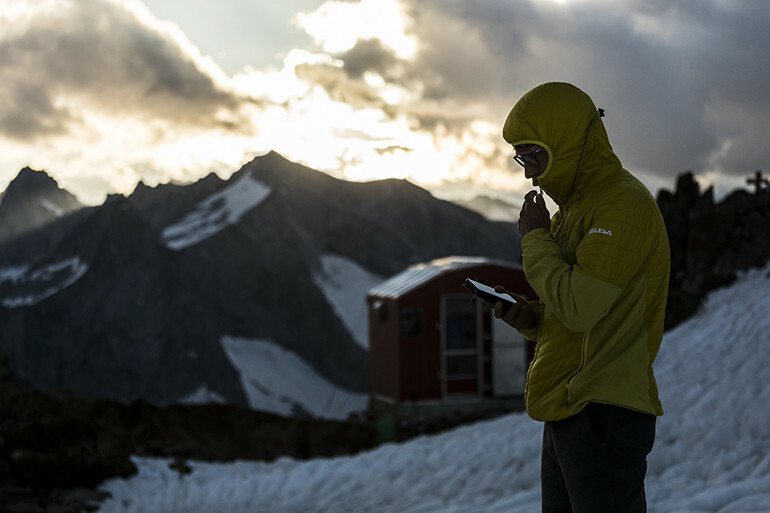 All night long the wind blows against the walls of the bivouac while the four rest after their hike. An altitude difference of one thousand and five hundred metres, from 1612 m in Chiareggio to 3152 m at the Oggioni. Including the intermediate stop at the Porro Ventina hut, as guests of the hut manager, Floriano Lenatti: with Valtellina food and mountain stories. 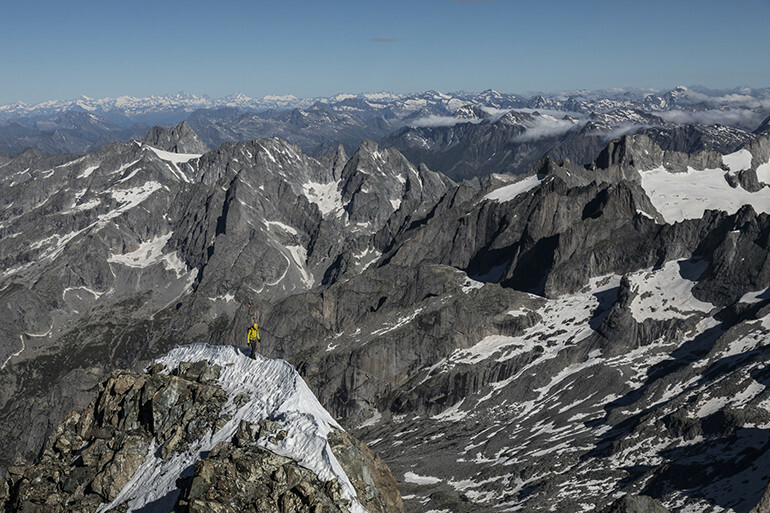 Now the Corda Molla – literally the Flabby Rope – awaits our four mountaineers, a spectacular alternating route that runs along the north-east ridge of Disgrazia, up to its peak at 3678 m. Only about a dozen climbing groups a year face this path, according to the Oggioni Bivouac book. 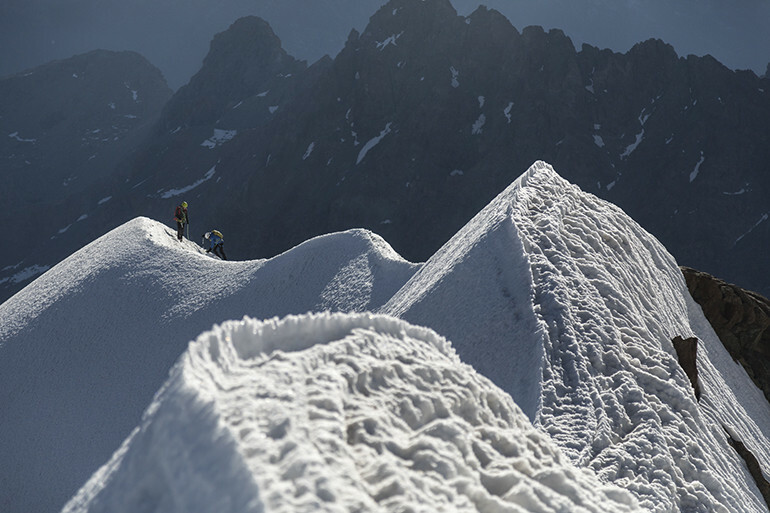 This morning there are two, led by two Salewa mountain guides and climbers. The youngest is Francois Cazzanelli, a 28-year-old from Valtournenche. A few weeks ago, he made it to the roof of the word, at 8848 metres, where, with a little help from oxygen, he accompanied the astronaut Maurizio Cheli. And just a few days later, he reached the summit of Lhotse with Marco Camandona, without any help, thus completing his first eight thousand metres without oxygen. The other one is Maurizio Folini. He is almost twice as old. Born in Valtellina, he is at home on Disgrazia. But he feels both at home in the mountains and in the air. In fact, his name is not only that of a respected mountain guide. He is the most experienced pilot in the world when it comes to high altitude mountain helicopter rescue. 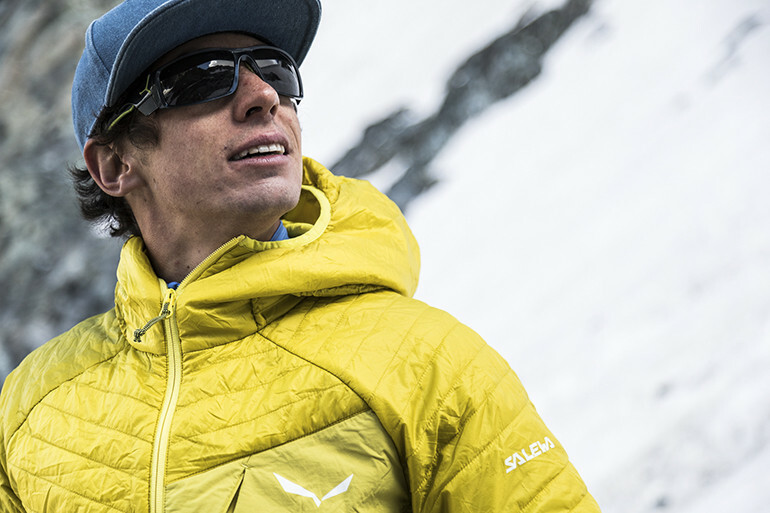 Maurizio is the record-holder of the highest long-line recovery ever made, at 7800 metres. Who Francois and Maurizio are accompanying today is a secret. Not a big secret. Just one of the small ones that will be revealed in a few weeks. 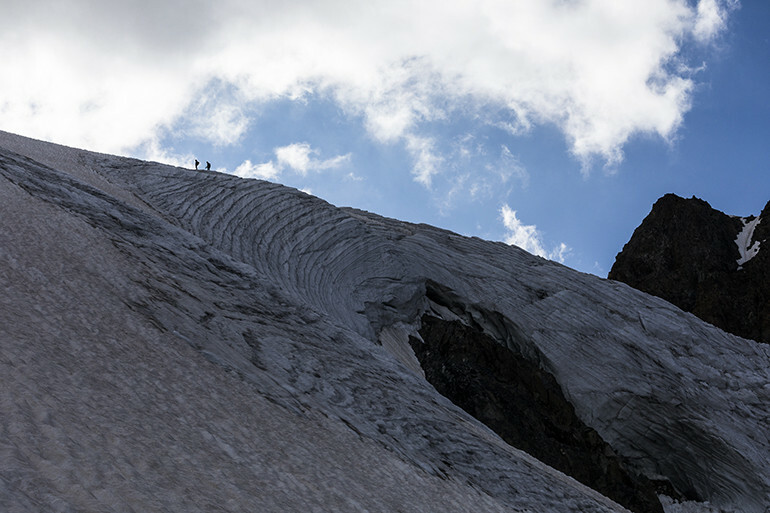 For now, it is enough to know that the two climbing groups reached the peak of the Disgrazia and then descended with eleven double ropes along the north-east wall down to the glacier. 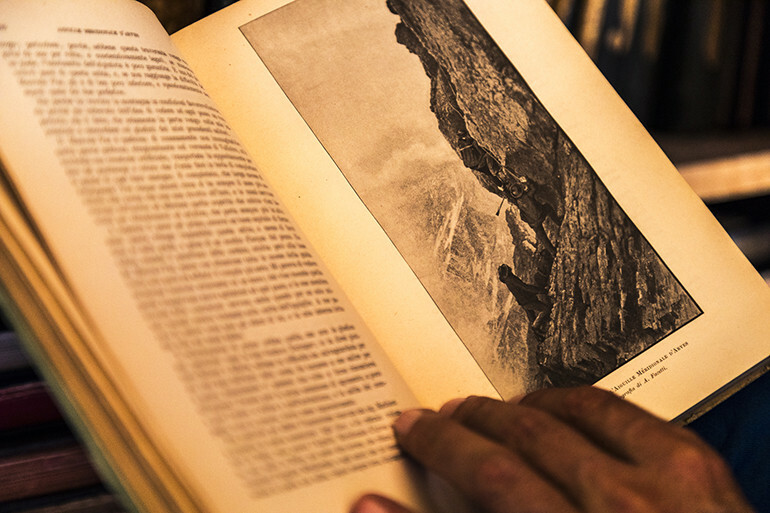 Through the wet snow, the four climbers returned to the Porro Ventina hut, where everything was just like the day before. There was Floriano, beer and a dish consisting of typical cheese and cured meat from Valtellina. Not exactly the worst way to end a beautiful day.